One of my kids is doing a school project, coincidently he’s doing forensics this year are reconstructing a crime scene! 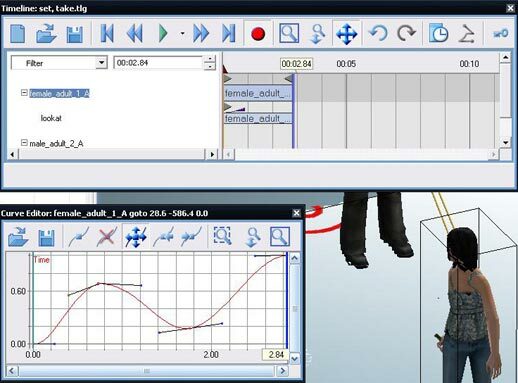 I found it amusing when he asked if he could use our Antics 3d application, given the direction Scene Systems are heading. Anyway he’s off and running and it’s an excellent example of how well suited Antics is to this type of use. The first thing we covered off was how to setup the floorplan to scale. 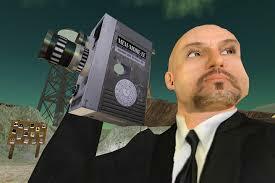 He has a blueprint of a home and is wanting to build it in Antics3d. We set the plan up as a .jpg 512×512 pixels. Texture maps for billboards will be resized if they are not a variant of this size. (ie 256×256, 1024×1024, that sort of thing.) The plan here (so to speak) is to use a billboard with the floorplan texture applied as a template for our construction. Now simply create a billboard (“house”), rotate it so it’s flat on a floor plan and then you are ready to set the scale. We were lucky because we had a doorway which was labelled as 1m wide. So in order to know what 1m was in the antics world, we built another billboard 1m by 1m. when rotated that to lay flat on the floor as well and then we could scale the “House” Billboard so that the doorway size matched the 1m Billboard. 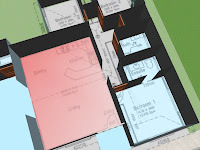 This gave us absolute confidence that the floorplan could now be traced with new rooms. A couple of good tricks, set the House billboard to FREEZE. Set the texture of the rooms you build as transparent or 50% opacity. (that way you’ll be able to see the measurements). Try to not have overlapping floorplans/rooms, they will cause problems when you want characters to navigate from room to room. As the project moves forward I’ll post the progress for you. I’ve been chipping away at the character creation challenge. You may have seen on my blog that I found some interesting examples of assets which Antics seemed to have purchase outright, (as opposed to creating them in house). So I’m thinking that at least a portion of some of the characters probably were outsourced also. 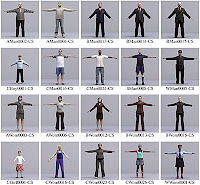 So I went in search of fully rigged 3ds Max characters and found bucket loads. Of course almost all were expensive. Some came in to max and exported quite well. Others required a bit more 3ds Max knowledge than I currently posses. With the 3ds Max Antics exporter, it’s now a given that Max is the only way to get extra character content into Antics. (with the exception of rigid body solutions. like the skeleton and Mech examples). Ultimately I’d like to learn enough to build my own character’s, import them into max, skin and rig them and sort out the bodyweights (that’s so the mesh doesn’t get messed up when the joints move). But for the mo, I’m happy enough experimenting with importing someone elses bipeds and perhaps modding them slightly. thanks to el_fuica for the character catalogue! 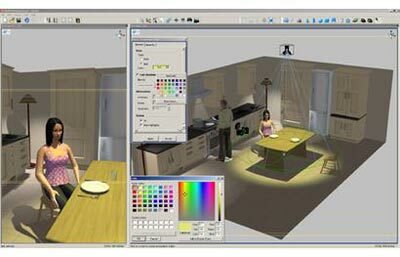 Here is a screenshot of LiveFrame, from the new owners of the product formerly known as Antics 3d. The jury is in, and the verdict on the future of the product development has been handed down. Scene Systems look to be a service provider, not a software provider. This means the product will certainly be developed as time goes on, but unless you create for Scene Systems, you’ll not get to see the newer versions of the technology first hand. Still, if Scene Systems are successfull in this new market, perhaps there’ll be an opportunity for those who have a skillset on the tools to freelance for them! You can order a back copy here They have a download section for software featured on the coverdisc here. Having a look through Turbo Squid I found this very familiar set. Here I was thinking the artists at Antics had come up with a really cool set design. Still, it doesn’t take anything away from the huge body of work they were responsible for. If you happen across any assets you find that Antics outsourced or aquired, please add them in the comments section. The new Antics 3d forum is growing and now has over 100 users. It is a great meeting place for Antics users of all levels. There are many open topics for discussion, including a help section where Antics support staff are still actively helping out. Also there a many threads on asset creation and charcter development. As well Colonel_Klink has some great screenwriting articles. Antics v5 is an excellent program for machinima and previz. and thanks to prolific forum poster “Infocentral” for finding it. Revenge from Pineapple Pictures on Vimeo.